A Review of "Looking Back to See: Elvis Presley and The Browns"
It’s not that The Browns saw themselves as Presley’s rival in the recording industry of the 1950s. 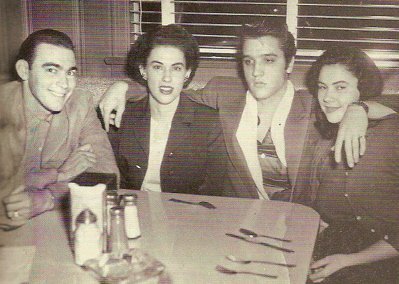 What they shared with Elvis was a personal relationship that grew as both acts struggled to build their musical careers in the mid-fifties. Music allowed both to rise above their poor upbringings. 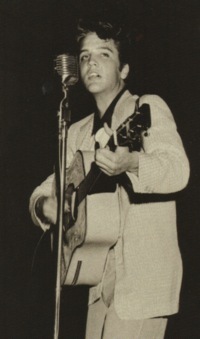 Both Elvis and The Browns recorded their first chart records in 1954, and they played the Southern backwater venues together until fame finally came their way. Maxine’s book is subtitled, “A Country Music Memoir,” and that’s exactly what it is. Her account of her family’s journey through life is filled with the traditional trappings of country music: humble origins, close extended family ties, infidelity, personal tragedies, and professional highs and lows (Two chapters are titled, “We Get Screwed” and “Screwed Again”). While Elvis played only a brief and intermittent supporting role in the career of The Browns, he obviously left an indelible impression on Maxine and her family. The book provides some interesting insights into the relatively obscure early career of the man who rose to be the greatest entertainer of his era. The Browns’ manager, Tom Perryman, introduced Elvis to Maxine, Bonnie, and Jim Ed (who Maxine calls “J.E.” throughout the book). “I’m so happy to meet y’all,” Maxine remembers Elvis saying at that time. “I’ve been listening to the Browns since y’all started.” According to Maxine, The Browns later asked Horace Logan of the Louisiana Hayride to give Elvis a chance on the show. “The rest, of course, is history,” she notes. When The Browns toured with Elvis in 1955, Maxine knew him as a down-to-earth young man. “I don’t think he ever had a big head or even gave fame a second thought,” she recalls. “He was too busy having fun and being young.” She saw two sides to Elvis—the shy, sensitive mamma’s boy and the wild joker. Maxine dismisses many of the judgments made by Presley’s biographers as guesswork. “You had to be with him day to day, facing the grind of the road, to really understand him,” she declares. 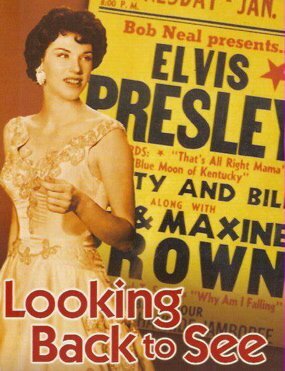 Maxine writes very little of Elvis’s sound in those early days, only that he “looked so young and sweet that you wouldn’t have thought he could produce such a big sound.” She praises the work of musicians Scotty Moore and Bill Black, who on one tour backed up both Elvis and The Browns. Club in Pine Bluff, Arkansas, on December 15, 1956. After Elvis went into the army in 1958, J.E., Maxine, and Bonnie’s contact with him faded. 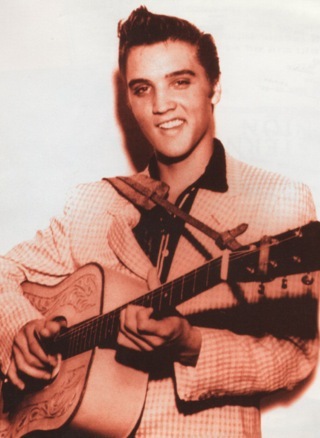 They talked with him on the phone once while they were on tour in Germany, and they ran into him at a RCA VIP party in Memphis after Elvis got out of the army. In Looking Back to See, Maxine Brown shares many other anecdotes concerning her family’s relationship with Elvis in the mid-fifties. In the end, the overriding impression her book leaves with the reader concerning Elvis is this: he spent his formative musical years of 1954 and 1955 immersed in the culture of country music. All of the acts he toured with were country acts—The Browns, Ferlin Husky, Johnny Horton, Hank Snow, Faron Young, Jim Reeves. He never toured with R&B acts like Chuck Berry, Fats Domino, or Little Richard. He felt most comfortable around people who embraced the simple values often voiced in country music lyrics and hymns. Maxine Brown’s book suggests that Elvis’s debt to country music, with its spiritual underpinnings, is much greater than is generally thought.